The domain name landscape changes in 2013. With the launch of hundreds of new top level domains over the next two years, It has never been so challenging to protect your brand name on the Internet. While most businesses have not even laid down a domain name strategy yet, today you even have to make the first decision about how to protect your brand name. The 26.03 the Trademark Clearinghouse has opened at 12 AM CET. We have done a graphic which shows the timeline to protect your brand names.I recently did a detailed post about how to send in your trademark to the Trademark Clearinghouse, and what information to provide. 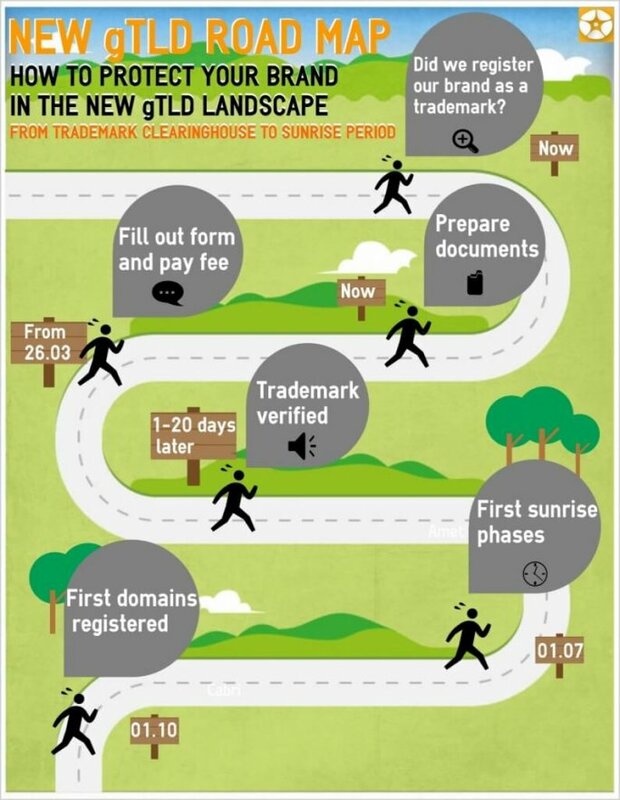 In the graphics below you can see the complete process from investigating if you have a trademark until securing your domain name in the Sunrise period. If you still don't have a trademark, then I recommend you to get one. (A Benelux TMcan be done in 7 days). Please post any questions in the comments field, and I will answer you directly during the day.